The Other Europeans is an international project that brings together 14 musicians from 8 countries to explore the common roots of klezmer and lautari music. Funded in 2008-09 by the EU, the project was created and directed by Alan Bern for Yiddish Summer Weimar and other music e.V. in partnership with the Jewish Culture Festival in Krakow and the KlezMore festival in Vienna. 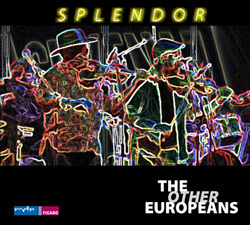 In addition to concerts throughout Europe and North America, the band has produced an award-winning CD ("Splendor"), been the subject of a feature-length documentary film ("The Broken Sound"), and received a Best Practices in Favor of the Roma Community award from the European Commission. In 2015, we are committed to continuing our work together in spite of logistic and financial challenges, and we are looking for opportunities for financial support to make that possible. SPLENDOR! Prize-winning, live double-CD. ***** Songlines. Splendor is available through amazon, google music, iTunes, CDbaby and other online sources. THE BROKEN SOUND! Feature-length documentary film, shot on location in Moldova, Israel, Budapest, Vienna, Weimar and more, NOW AVAILABLE!